The APM classic service is our original proven service to keep your dog clean and smelling great. To enhance this service further we also offer additional services to suit your dogs specific needs. When you book your dog in for a Classic Service with Aussie Pooch Mobile, your dog will not only be left feeling and smelling great, they will also receive…. Mobile Hydrobath- A warm, fresh water dog wash using environmentally friendly, flea kill solutions in a dog hydrobath that will clean your dogs coat, relieve skin problems and improve coat condition. Brushing- A massaging brush to loosen your dogs coat & remove light matting. Regular brushing is also important for de shedding your dog. Nail Clipping- This will ensure your dogs paws are kept in great shape. Ears & Eyes- Your pooch’s ears and eyes will be hygienically cleaned to remove wax & sleep. Aromacare- These Aromacare solutions specifically made for dogs are more then just a pleasant scent. There are 2 Essential Oil rinses for you to choose from to enhance the dog wash. You can choose from Lavender or Rosemary! Deodorant- This will add lustre to your dogs coat & also smells great. Blow Drying- Blow drying removes any excess water after your dogs bath. Your dog will be ready straight after his bath to cuddle & play with. Doggy Treat- Your Classic Service from Aussie Pooch Mobile will always be finished with a reward for your dog. After their bath they will be treated to a healthy pooch treat that they will love! What is a dog hydrobath? Many people are still puzzled about what a dog hydrobath really is and how they can help in taking better care of your best friend. Some may even see it as a piece of indulgent equipment, since bathing dogs can be done with a hose or in the bath tub depending on the needs of the dogs coat. A dog hydrobath is a combination bathtub and power bather that uses a specially designed recirculation pump. This pump produces a high volume mix of water and shampoo delivered powerfully enough to penetrate the thickest of coats, yet gently enough to massage the skin. 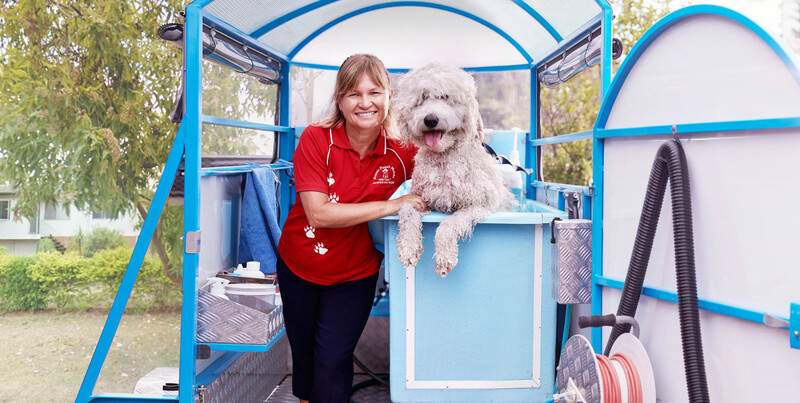 Aside from the obvious other reasons why Aussie Pooch Mobile is the better alternative (we come to you, environmentally friendly solutions made for dogs, helpful dog related advice, a more thorough service by trained professionals, ears and eyes cleaned, nails clipped plus more), using a hydrobath to wash your pooch should definitely be on the top of your benefits list. And here is why…. A dog hydrobath system provides deep cleaning of your dogs coat which they require for a number of reasons. First of all is for parasite control. As parasites always come from the outside then start lingering in the coats in their way to climb into the insides of your pet, a thorough cleaning is highly recommended regularly, most especially if they are already inflicted with the pests. Dog hydrobaths, when used correctly, achieve great results in curing skin disorders and promoting hair growth. This powerful pump massage can help prevent arthritis through the massaging effect and it will also help to clean your dogs skin of allergins, dirt and grime therefore helping dogs with sensitive skin. Dog hydrobaths are also simply amazing for just pampering your pets. The hydro-combing action of the spray head will help a lot in stimulating the skin, in turn, providing a good massage for your pet, allowing better blood circulation, and relieving of tired muscles which are especially good for older dogs. Aussie Pooch Mobile dog wash groomers are extensively trained in the operation of the hydrobaths in order to achieve and maintain the best well being of your pooch. Contact us today!